The Beau Sancy, a 34.98 carat diamond that will be put on sale by Sotheby’s auction house in Geneva next month, is presented in Paris, Monday April 23, 2012. The Beau Sancy diamond, a stone of historical importance with a royal provenance stretching back to Marie de Medicis is estimated between two and four million dollars, (1.5 to 3 million Euros). AP Photo/Remy de la Mauviniere. By: Thomas Adamson, Associated Press PARIS (AP). – The 400-year-old “Beau Sancy,” one of the world’s oldest and most storied diamonds in private hands, is up for sale at Sotheby’s auction house. 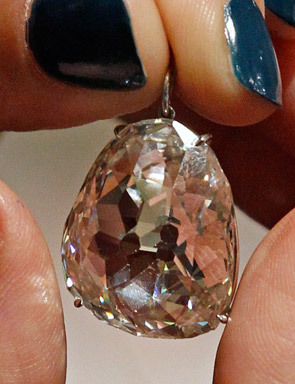 Weighing in at 34.98 carats, the sparkling gem with a rare pear cut is expected to fetch up to $4 million. For now, the jewel is on display in Paris and will move on to London and Zurich before it gets auctioned off in Geneva on May 14. Such was the diamond’s fame that in 1604, French King Henri IV purchased it from the first owner, the Lord of Sancy, as a gift for his glamorous wife, Marie de Medici, one of Europe’s richest women. Following the king’s murder, she fell into poverty and was forced to sell the jewel, which was cut from the famous gem mines in the Indian city of Golconda.